“What are we doing for New Year’s?” It was a week before New Year’s Eve and when my friend asked me I had no idea what to say. 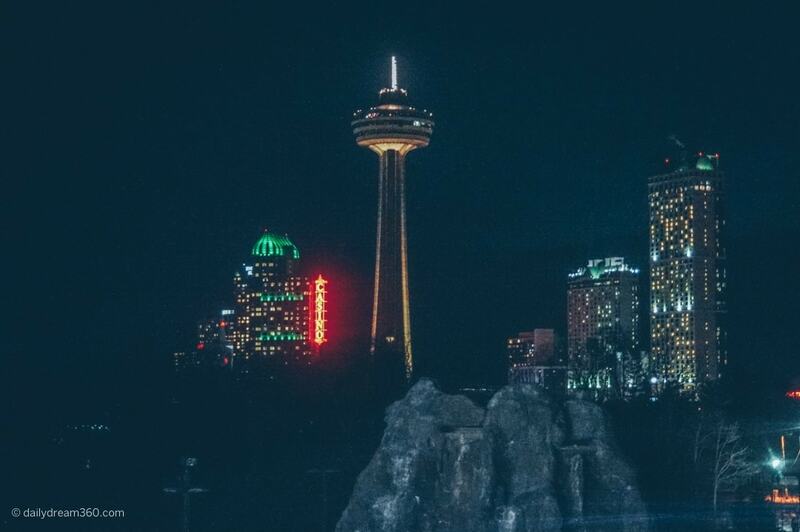 Niagara Falls came up in conversation, but when I looked up hotels in the city, we were looking at $300-$800 per night for a room. 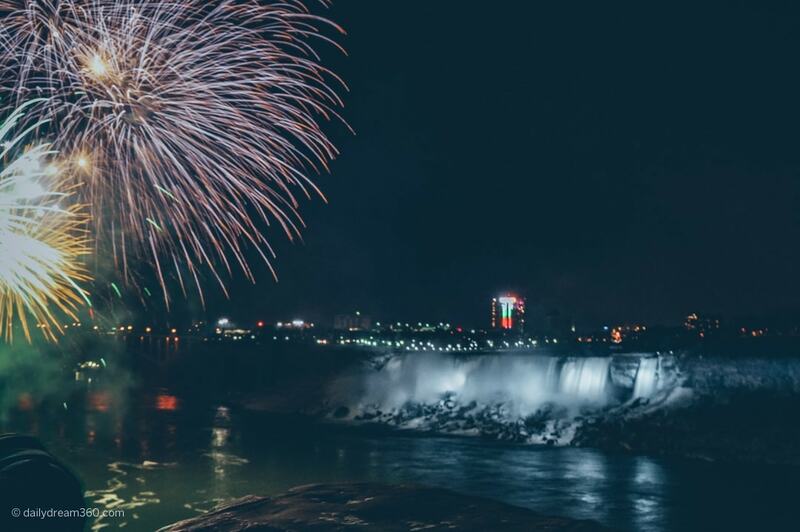 In the end, we planned a last minute New Year’s Eve in Niagara Falls for under $100 each. Find out how in this post. 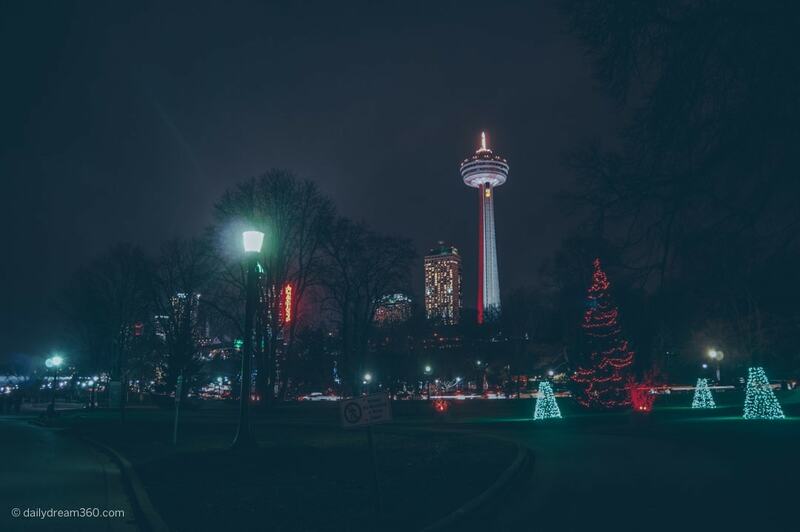 Since we did not want to drive from Toronto to Niagara Falls and back in one night, our first obstacle was finding a hotel two-days before New Year’s Eve, that did not break the bank. Finding a hotel on the strip was not going to be affordable, so I looked at neighbouring regions on the Choice Hotels website. To my surprise, just two days before New Year’s Eve I found a Comfort hotel in Welland Ontario for $99 a night. I love these hotels because they offer clean, comfortable rooms, free wifi and a complimentary breakfast. There are also a number of them located between Toronto and Niagara Falls, breaking up the long drive home after midnight. The drive to the falls from the hotel in Welland according to Google maps would be a mere 20-25 minutes. 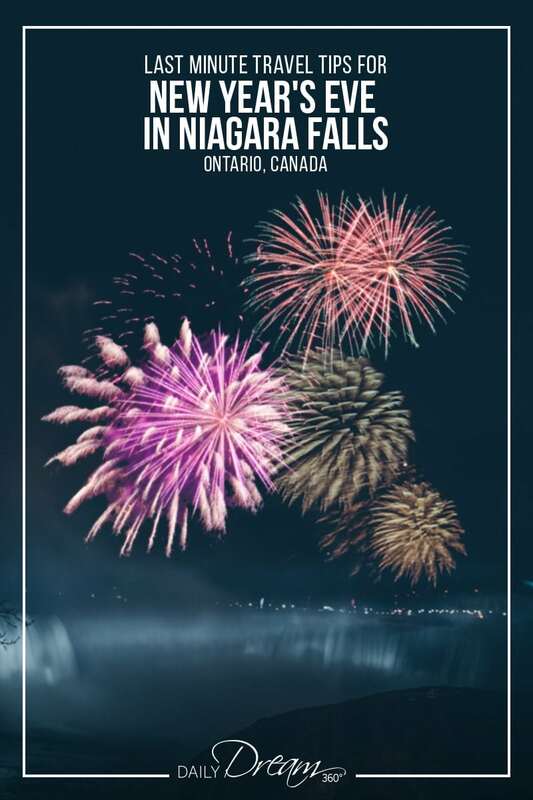 Between the two of us, we were looking at $55 for the hotel, $10 for parking and approximately $10 for gas and we had New Year’s Eve in Niagara Falls for under $100 each. We got into Niagara Falls by 5:30 PM which as I learned later was very lucky as traffic into the city became impossible as the night drew on. The traffic reports stated that the QEW was backed up and that police closed off many roads into the city in the hours after we arrived. 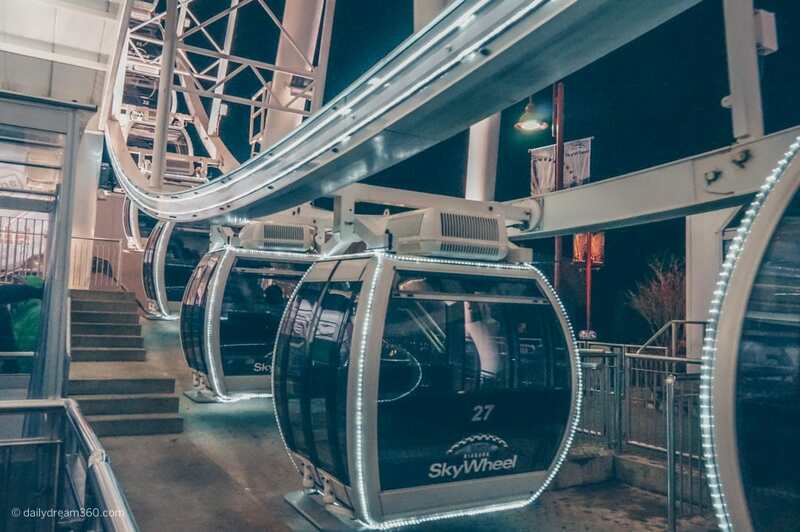 My go to parking lot in Niagara Falls is the Skylon Tower/Imax Theatre parking lot which on event nights is usually $20. Since we arrived early, that was the price to my glee. However, the attendant told us the price might go up as the night went on. Coming early meant we could park by one of the parking lot’s exits which helps get you out of the lot and Niagara Falls after the events end. 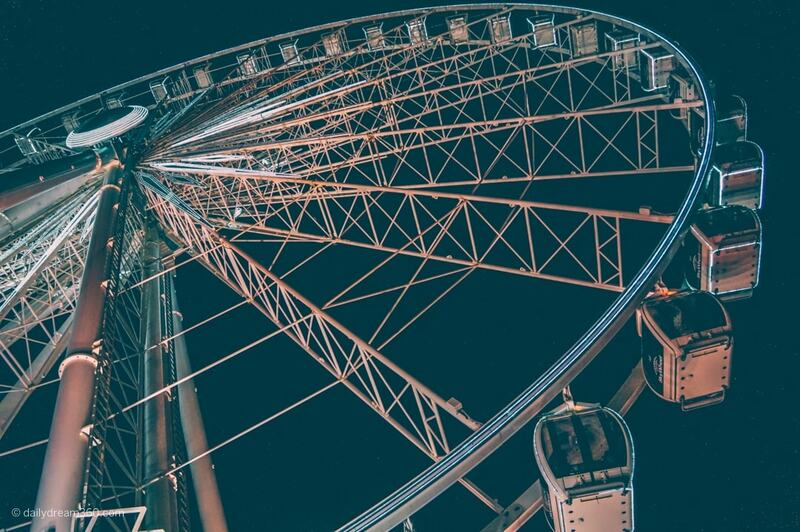 As we drove in the massive lit-up Ferris wheel caught both our eyes. 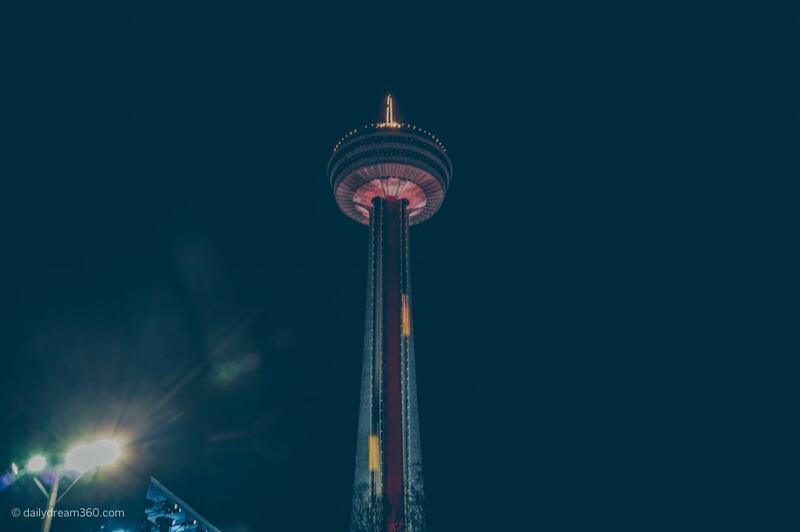 My friend and I both are not big fans of heights, but we knew that starting the year facing our fear and doing something we’ve never done before was top on our list. For me, this was the best $13 I’ve spent on a ride. The views were breathtaking and as I faced my fear of heights and leaned my camera against the window to avoid the glare I got some fantastic photos of the city at night. We were surprised at how quiet it was as we walked from the main strip in Niagara Falls towards the falls. There didn’t seem to be many people around, especially on the boardwalk in front of the Falls. It was quite cold outside, and eventually, the sidewalk did fill up. 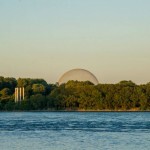 As we walked towards the Canadian Falls and the Skylon Tower we started to hear the crowds. 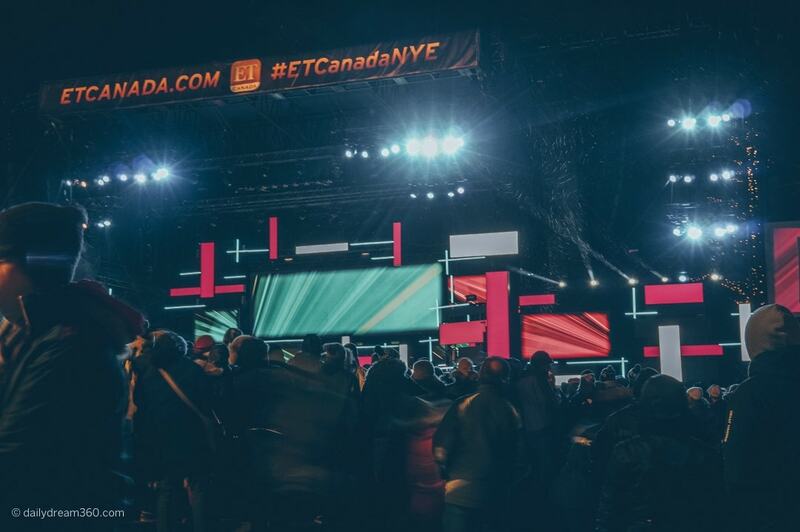 Many had gathered in front of the large stage getting ready for the New Year’s Eve concerts. It was still early in the night, and the first act had yet to hit the stage, but in front of the stage was a massive crowd of people that grew as the night went on. We did not head into the middle of this crowd near the stage, but even on the outskirts we had a great view of the stage and were able to enjoy all the bands. At 8:00 PM some warm-up bands came on to entertain the crowds, but the real show began at 10:00 PM with the live broadcast and there were regular breaks during commercial breaks, but the performances were brilliant considering it was freezing outside. I don’t know how they played instruments in the cold as I could barely keep my gloves off to take photos! Across the street from the stage was a Tim Hortons where we (and most people) went to warm up throughout the night. There were lineups to get into the restaurant and to order coffee or get a bite to eat. There were also washrooms in this building that were remarkably clean despite the number of people using them throughout the night. On the street outside were also some portable toilets. I don’t know how many times we stood in line to get into this Tim Hortons, but I can say it was the only way to stay warm and to keep from frostbitten fingers and toes! Note to self – dress warmer next time! There was some confusion as to where the fireworks would appear and at what time which for me made finding the right spot to set up my tripod for the perfect shot difficult. 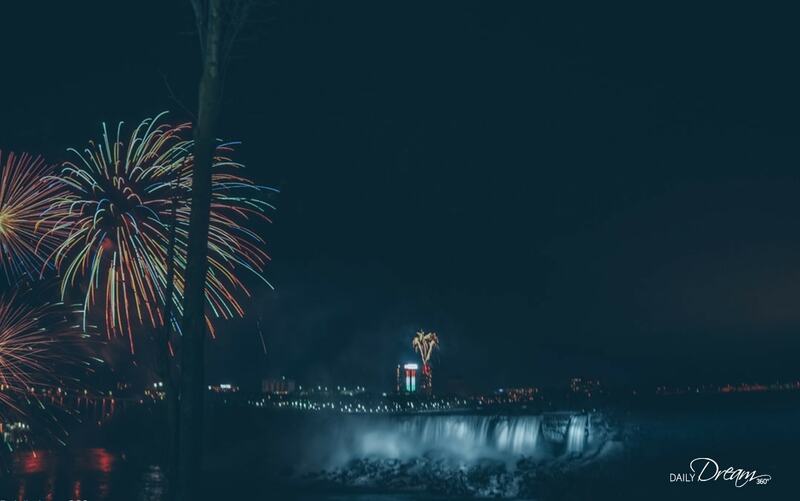 The first fireworks display is scheduled at 9:00 PM and appears in front of the American Falls. The midnight fireworks show was much bigger one year, but when I returned a second year it was not that grand. Fireworks lasted less than 10 minutes on the Canadian side and went on a little longer over the Casino on the American Side. 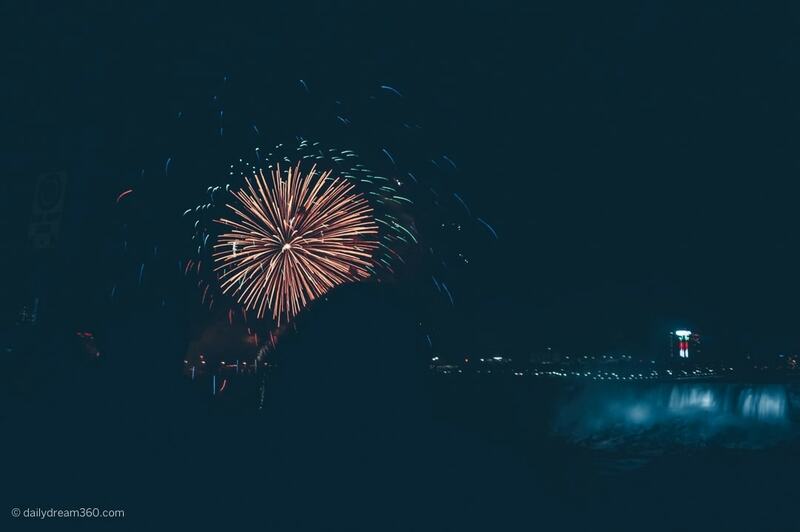 However, during the second fireworks display, there were fireworks in front of both the Canadian and American Falls and behind me on the Skylon Tower. The second time I went to the Fireworks shows at 9 PM and 12 PM were identical and only appeared over the American Falls. The Canadian fireworks display ended, but we were still treated to the American fireworks display on the other side! IT WAS COLD! That night was very cold, and although we dressed in many layers, standing at the concert stage, it was hard to stay warm. If I am ever to do this (or another winter night like it) again, I would recommend dressing for the cold. I had on many layers, two pairs of warm wool socks, thermal underwear under my jeans and even two pairs of gloves but the cold still got the best of me. Next time I will probably pack snow pants, warmer boots and a few more layers! TRAFFIC! 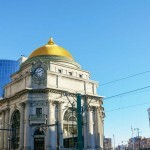 We were fortunate that we got into the city early. Something to note if you are coming into the area make sure you get in earlier rather than later. Also when leaving the city prepare for delays. 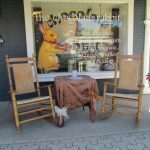 It took us a long time, even though we got out of the parking lot quickly to get out of the downtown core. Traffic was gridlocked after the event so prepare to sit in the car as you try to get out of the city. It took us at least 30 minutes to just get out of the downtown area and then a mere 20 minutes to get to the hotel, but if you are driving back to Toronto the same night prepare for a 30 minute – 1-hour delay just getting back to the QEW. Plan Ahead! 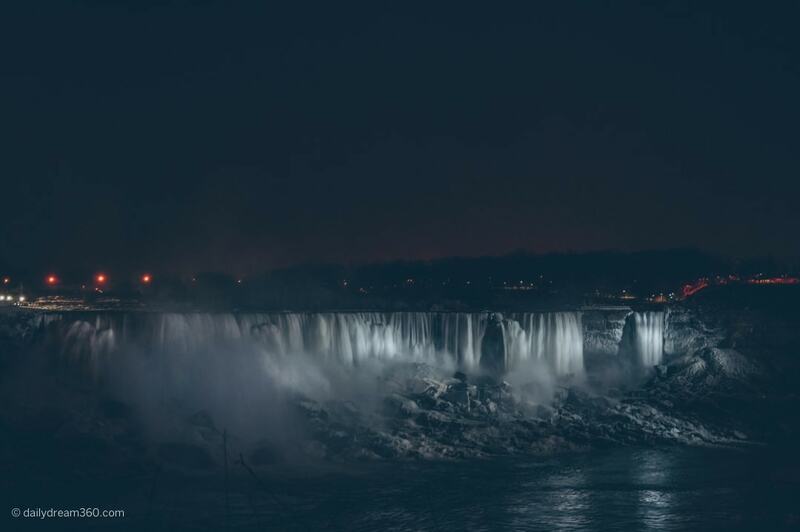 Had I looked into Niagara Falls a little earlier we likely could have found a hotel closer to the city or in the town at an affordable rate. 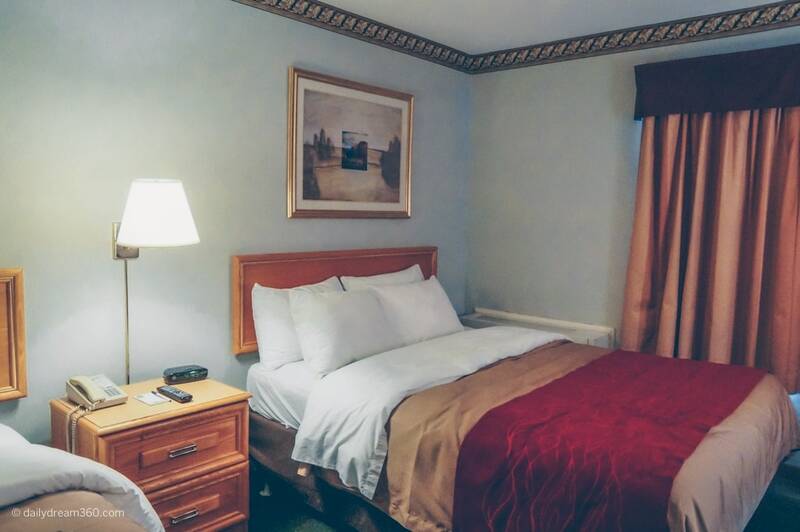 Our hotel in Welland, for example, was $89 a few days before we made the decision to book it. There are other affordable hotels in the area that likely would have been great options, including the hotels on Lundy’s Lane! We noticed Niagara Transit was running buses from the falls up Lundy’s Lane well past midnight! 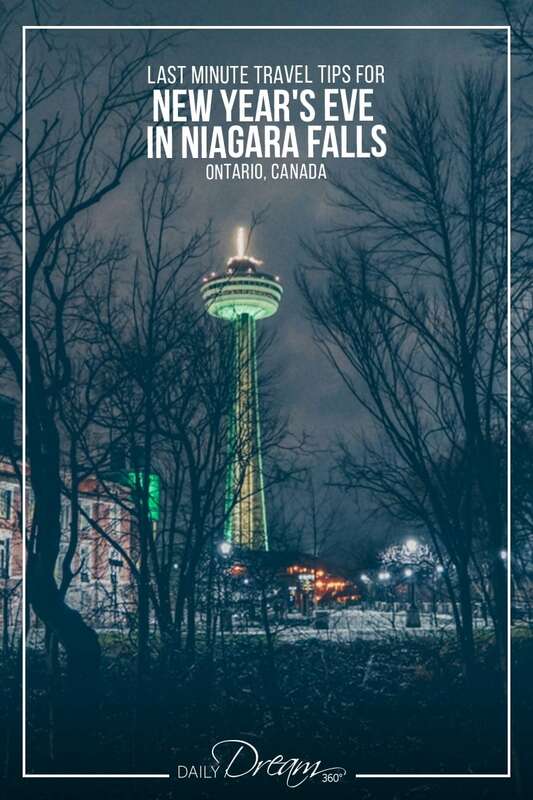 Do you have any tips to share about Niagara Falls? 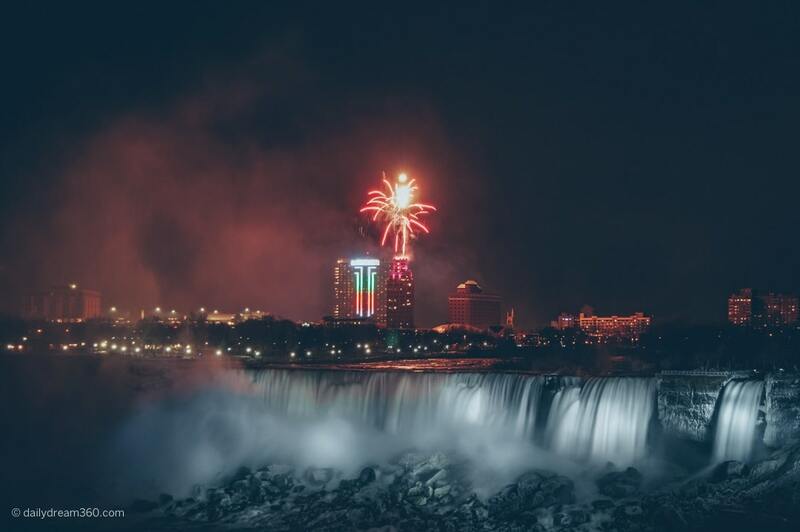 Did you ring in the New Year at the Falls? I would love to hear your stories and suggestions in the comments below! 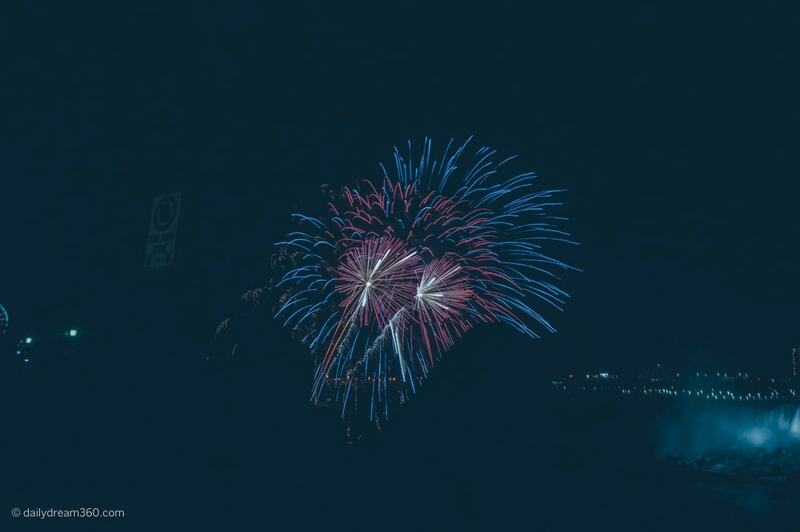 Awesome photos of the fireworks!! I’ve never been able to capture fireworks in photos and quite honestly gave up trying years ago and just resign myself to oohing and ahhing instead. Here’s wishing a great 2015 is in store for you – you certainly did start the new year with a bang!